The streamlining exercise is part cost-cutting, but likely part handouts for elite cronies. Turkmenistan is set to halt state funding for research institutions, dealing another blow to a higher education system crippled by decades of profound isolation. The decision, outlined in state media reports on January 29-30, is just one of a raft of parallel moves intended to drastically cut spending as the government struggles to cope with a chronic economic slump. TDH state news agency reported that research and training institutions will have to become self-supporting within the coming three years and will “more actively interact with business and investors.” All forms of specialized study are in effect being privatized. 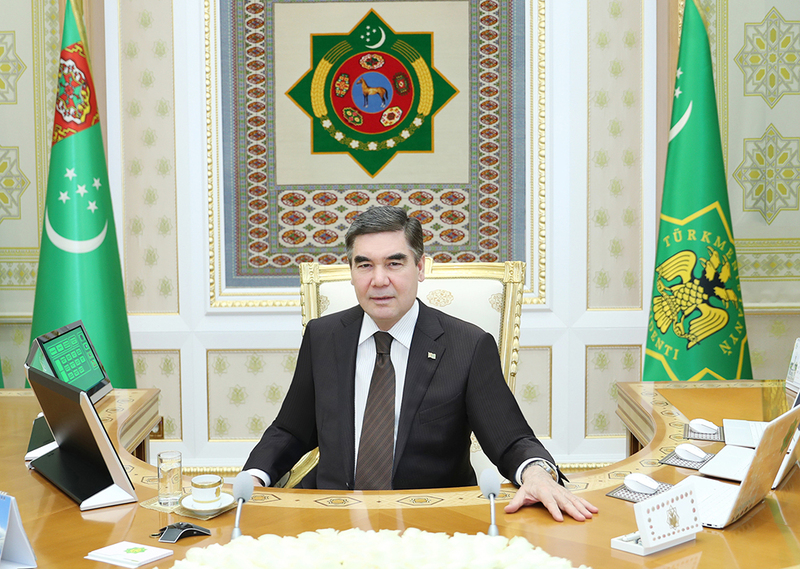 The wide-ranging set of measures to streamline the scientific establishment adopted by President Gurbanguly Berdymukhamedov on January 29 included a decree on halting state funding for the Turkmenistan Academy of Sciences. Berdymukhamedov announced his proclamations in a videoconference call, which has become his favored mode for communicating with subordinates. As TDH reported on January 30, a conference of scholars at the Oguz Khan University of Engineering Technologies in Ashgabat was corralled to give token blessing to this radical decision, which will also see various branches of the Academy of Sciences cannibalized and spun off to universities. In line with this reform, the Institute of Livestock and Veterinary Medicine is to be transferred to the Turkmen Agricultural University. Likewise, the remnants of the Institute of Biology and Medicinal Plants — of which more below — will now fall under the Oguz Khan University of Engineering Technologies. According to the state news account, this kind of restructuring will enable the research community to optimize effectiveness and parlay those improvements into enhanced economic productivity. Some institutes have been consolidated but left under the aegis of the Academy of Sciences. That was the case with the Makhtumkuli Institute of Language and Literature and the National Institute of Manuscripts, which have merged to become the Makhtumkuli Institute of Language, Literature and Manuscripts. And there is a case of one research institute becoming two, seemingly to cater to one of Berdymukhamedov’s hobby-horses. The Institute of Biology and Medicinal Plants has been split into the Institute of General and Practical Biology and the Institute of Medicinal Plants. The president has put his name to two glossy volumes called Medicinal Plants of Turkmenistan. The government is not trying very hard to disguise the fact that it is simply looking everywhere to save money. This major overhaul of research institutions was unveiled on the same day that Berdymukhamedov approved the equally radical streamlining of numerous state departments. So, a newly formed Industry and Communications Ministry will now incorporate multiple bodies — the Industry Ministry, the Railway Transportation Ministry, the Roads Ministry, the Communications Ministry, the State Maritime and River Transport Service and the State Aviation Service. The National Space Agency is similarly to be downgraded and turned into a department within the communications ministry. The state agency that once was responsible for overseeing the building of highways will be absorbed into the Construction and Architecture Ministry. The National Meteorological Committee will become a branch of the Agriculture and Environmental Protection Ministry. This latter ministry, incidentally, is a new creature. The Agriculture and Water Management Ministry and the State Committee for Environmental Protection and Land Resources have been merged and then chopped up again to form an Agriculture and Environmental Protection Ministry and a State Committee for Water Management. A third strand of this reorganization will see the privatization of a swath of industries currently under state control. Bodies now responsible for running the railways, roads, telecommunications, maritime and river transport and the national air carrier are to be converted into joint-stock companies. AFP news agency quotes Berdymukhamedov as saying this was done to “help strengthen the competitiveness of the national economy" and boost investment. Berdymukhamedov has not indicated which investors are likely to want to acquire stakes in those entities, but there is every certainty that they would be found among Turkmenistan’s would-be entrepreneurial classes. In other words, figures inside or close to the ruling elite. This massive — and yet closed-club — privatization spells possibly worry developments for the population at large. A transportation industry run for maximum profit would augur a relentless increase in the price of air and train tickets, as well as growing highway tolls. Such price inflation might be tolerable in a prosperous nation, but Turkmenistan has been driven to the verge of economic penury by catastrophic mismanagement and a perilous reliance on exports of natural gas. This will also compound the rise in the cost of living created by the government’s decision to finally end the more than two decade-old free allocation of household gas, electricity and water as of January 1.